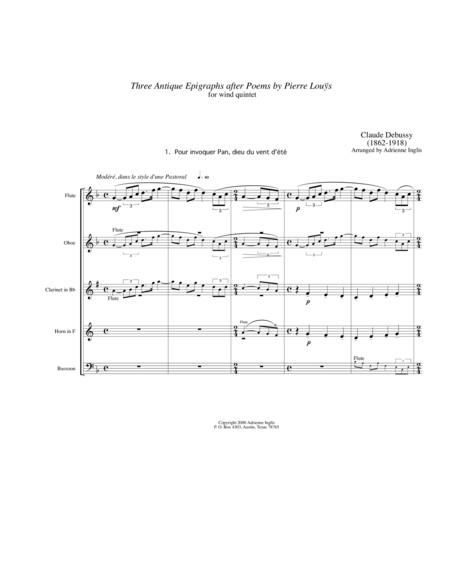 Three movements of Claude Debussy's "Six epigraphes antiques" composed in 1914-15 for piano four-hands are skillfully arranged for flute, oboe, clarinet, bassoon, and horn in this arrangement by flutist and composer Adrienne Inglis. The three movements of "Three Antique Epigraphs" are "Pour invoquer Pan," "Pour que la nuit soit propice," and "Pour remercier la pluie au matin." 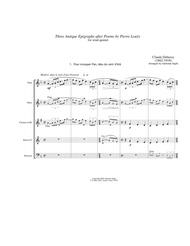 A professional or graduate student wind quintet will enjoy blending rich wind colors in this engaging arrangement. The pdf includes a complete score and all five parts.